The Altea fills an unusual brief in the SEAT range, appealing to those buyers wanting a little bit more practicality than a Leon hatchback, but not the full-on usefulness of an MPV. The Altea fills an unusual brief in the SEAT range, appealing to those buyers wanting a little bit more practicality than a Leon hatchback, but not the full-on usefulness of an MPV. SEAT describes the Altea as a compact MPV, though in reality it’s little more than a more spacious hatchback, lacking the sort of interior flexibility and versatility that marks out the best compact MPVs in the class. Still, if the idea of a slightly larger hatchback appeals, where you sit a bit higher for a better view out, then the SEAT Altea isn’t without merit. 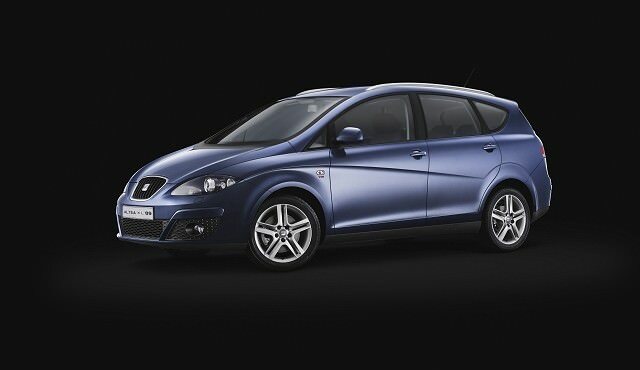 SEAT’s larger hatchback comes in three forms: the standard Altea, the Altea XL and the Freetrack, though the latter was not officially sold in Ireland. The XL is, as its name suggests, extra large, it gaining some length to add some additional boot space should you need it. No more seats though; but the additional space is useful, and the XL’s shape is arguably smarter thanks to its greater length. The Freetrack is SEAT’s take on a pseudo-SUV, it being a Altea XL riding on 40mm higher suspension and featuring non body-coloured bumpers. Never officially available in Ireland, if you find one it has been imported from the UK. As a five-seat car only the Altea’s biggest draw is its higher seating position, which affords a far better view of the road ahead over its Leon relation. It drives well too, though lacks the sophisticated ride and handling balance of the latest compact MPVs. Engine choices echo that of the Leon hatchback, which means a choice of 1.4-litre, 1.6-litre, 1.4 TSI, 1.8 TSI and 2.0-litre petrol options and 1.6-, 1.9- and 2.0-litre TDI diesels, but you’ll find choice in the Carzone classifieds is limited to 1.6-litre petrol, 1.9 TDI and, in more recent cars, the 1.6-litre TDI engine. The trim lines follow SEAT’s Reference, Ecomotive and Sport options on the newest cars, with a mix of trims available on older models. Being SEAT all come fairly well specified, with it not unreasonable to expect remote central locking, electric windows and air conditioning on all but the most basic of levels. Inside, the Altea might not have the measure of its more recent compact MPV rivals, but it does well in oddment stowage, with plenty of cubbies scattered around the interior to hide day-to-day detritus, while a split floor boot and rear seats that slide fore and aft adds some space to the luggage area when it’s needed. Depending on budget and age, either the 1.9 TDI or later 1.6 TDI are fine choices. Trim levels are all generous so buy on availability and condition. Automatics are offered, but the manual cars are more economical and cheaper to buy, too. The standard Altea is spacious, but the XL adds useful space for a growing family - and all the kit they require. It might be little more than a taller hatchback, but the Altea makes a case for itself as a more spacious choice for a growing family. One for the practically minded perhaps, but the Altea drives as well as many conventional hatchback, so the compromises for its additional space are very few indeed.